Fastracks are the best system to drain, stack and store bottles of various sizes. They are compact, stackable and unlike a bottle tree they eliminate contact with the inside of the bottle. 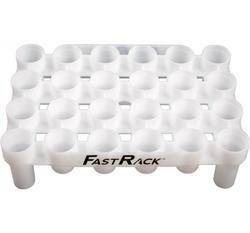 FastRacks are versatile and fit various bottle sizes to ensure all bottles can be stored efficiently. They take up minimal space and can be stacked up to 10 high for compact storage. PLEASE NOTE: Not all sized bottles will fit 24. 750ml and 640ml bottles may only fit half this.